HYT tantalised us recently with a sneak peek of the third generation H3 that we wrote about a few weeks ago. Then, there was much speculation of what the hidden parts of the press picture would show and we waited with bated breath. Today the wait is finally over, with the first press picture of the watch released and with its previously shrouded details revealed in all their glory. First of the bat, the H3 presents a very different look from what we have come to expect from HYT. 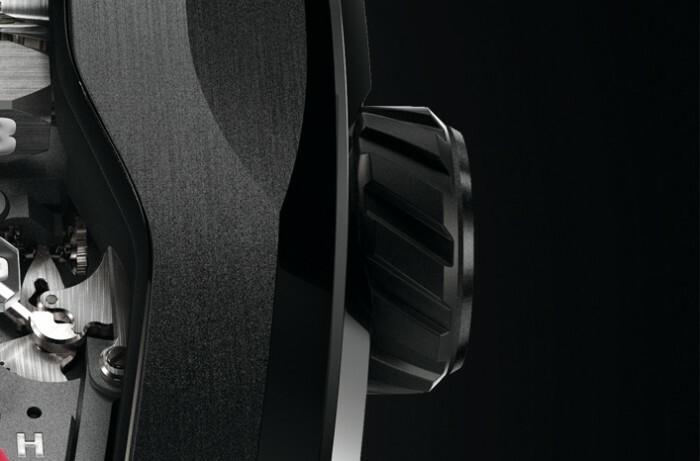 The H1 and H2 after-all used the innovative fluid mechanism in a more traditionally circular path in a round watch case. 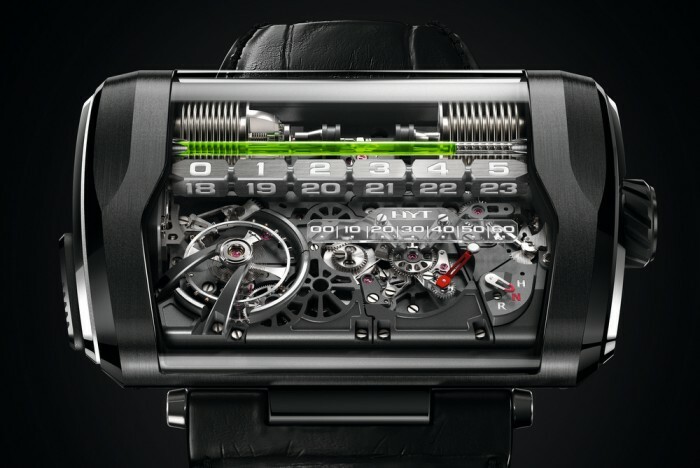 The H3 is entirely different, with the time-telling fluid now taking a straight path across the face of the watch and in a rectangular case to boot. Of course, there was a hint of such possibilities already with the Skull watch that HYT showed us, demonstrating the brand’s mastery of making the fluid path in different and complex shapes. The H3 then, perhaps is an exercise in showcasing one more possibility in what the technology can do in service of an entirely new design. 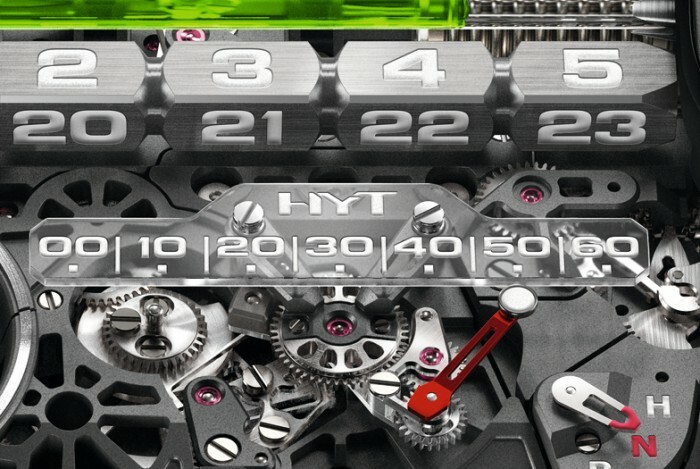 Time is told linearly by HYT’s trademark fluid in green this time, moving along a scale of hours made up of rotating cubes. Four faces on each cube represent four hours, with the entire line of cubes making a quarter rotation every six hours to make up the full twenty-four. In a six hour journey, the fluid moves in a straight line from left to right, and upon finishing causes a quarter rotation of the row of cubes (for the next six hours), whereupon the liquid makes a controlled retreat back to start the process again. The minutes are told by a red retrograde hand indicating against a graduated scale just below the hour cubes. How is this watch set? 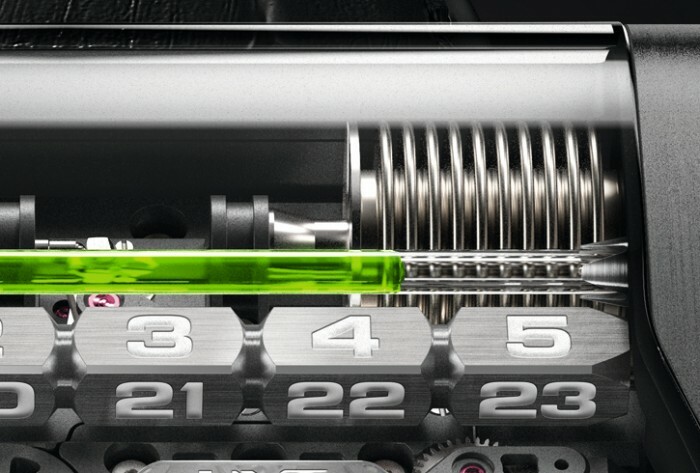 – Via a combination of two controls, the push button on the left of the case rotates the cube row, allowing hours to be set swiftly per six hours. While the exact hours and minutes are set with the more traditionally located crown on the right of the case. 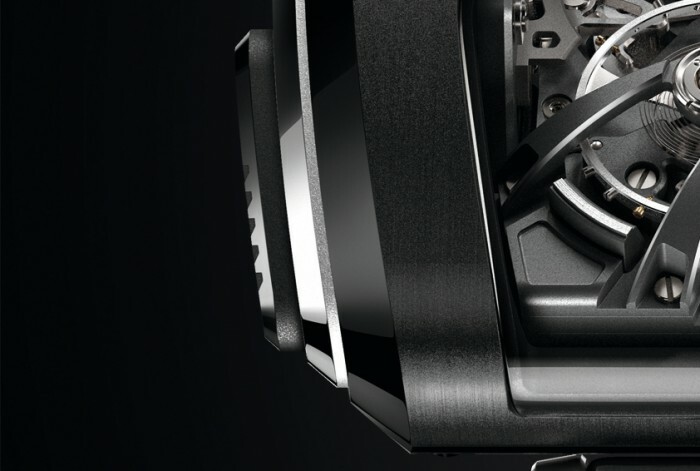 Note the interesting detail of the bellows mechanism at the top of the watch, arranged linearly as well, and controlling the progression of the fluid across the face of the watch. 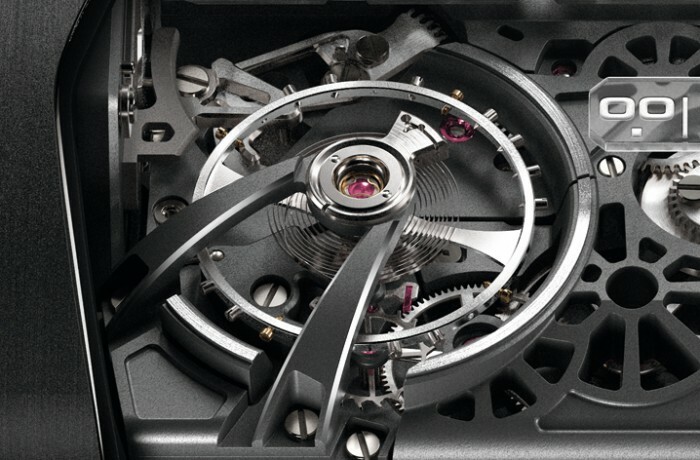 The movement beating within the H3 is a manual winding HYT calibre beating at 21,600 Vph of 3 Hz. Aside from the more obvious technical achievements that this watch presents, there are also interesting details in the movement, such as the decorated micro-blasted charcoal grey and PVD-coated titanium bridges, titanium-coloured satin-finished accents and the rhodium-plated bellows. Best of all, one can get an eyeful of the beating balance wheel at bottom left, running for a staggering 170-hours. Yes, you’ve heard that right, this watch holds a 7-day power reserve! Series limited to 25 pieces, the new H3 will certainly be the star piece for HYT at Baselworld this year, and we are looking forward to have some hands on action with it, along with live pictures. Look out for it!